Here is How To Get Custom Colorful Bash on SSH on Ubuntu and Other GNU Linux Along With Syntax Highlighting for Nano Text Editor. Quite Easy Steps. While iTerm2-Homebrew-Oh-My-ZSH gives hundreds of colors, it is quite pathetic to work with white colored texts with some color provided by iTerm2. No worries, you will get colorful Bash on SSH with Syntax Highlighting on your Ubuntu or other GNU Linux instances. We have discussed about how to get Nano Syntax Highlighted in our previous guide. Do not make Nano your default text editor. Do not change Bash to ZSH as default shell. Understand this – if you login as ubuntu then run sudo su to become root, then you have to do the steps twice – one for ubuntu and one for root. We usually keep the /root directory clean. But, as root‘s $HOME is at /root, we will do the things here, so – do not delete the things recursively later. When we are using iTerm2 to SSH to Ubuntu instance, iTerm2 and ZSH will force some color, but not much. There are two steps of the work. Remember what you have done by writing it somewhere. We might change or correct steps later to make all Linux distort working in the same method. You will get some colors. We are talking about two steps. Possibly, we can say – two options. If you are satisfied with this, you need not to do the next step. 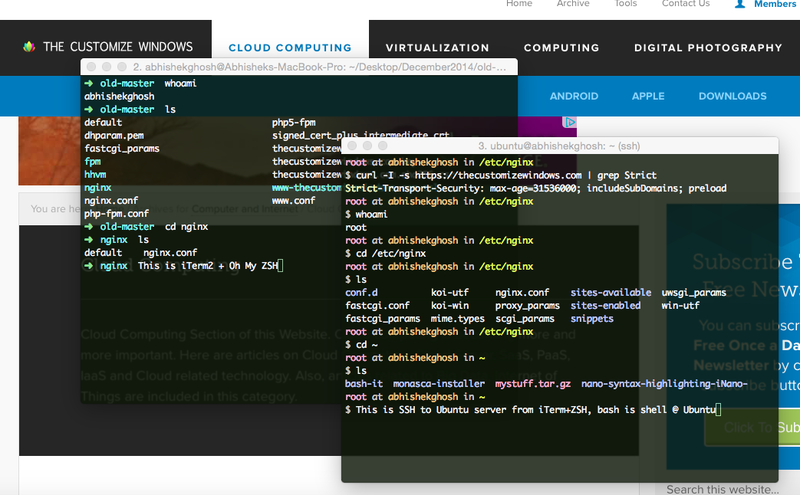 The next step is using a ready to use Oh-My-ZSH Theme clones intended for Linux desktop. Take a manual backup of the .bashrc file. If you do not like the things, you can simply delete the modified .bashrc and make the backup active and run source ~/.bashrc. Whenever there is color related thing and searching our website or asking us does not give properly reply, go to Arch Linux Wiki. We are not color expert, but better to follow some website, which is running for few years and works around core stuffs. This Article Has Been Shared 3395 Times! Virtual Desktop Interface as a term, may confuse with the usual mechanism for monitoring remote display. VDI currently does not support for every mobile device. Cite this article as: Abhishek Ghosh, "Colorful Bash on SSH with Syntax Highlighting (Ubuntu)," in The Customize Windows, January 22, 2015, April 25, 2019, https://thecustomizewindows.com/2015/01/colorful-bash-ssh-syntax-highlighting-ubuntu/.